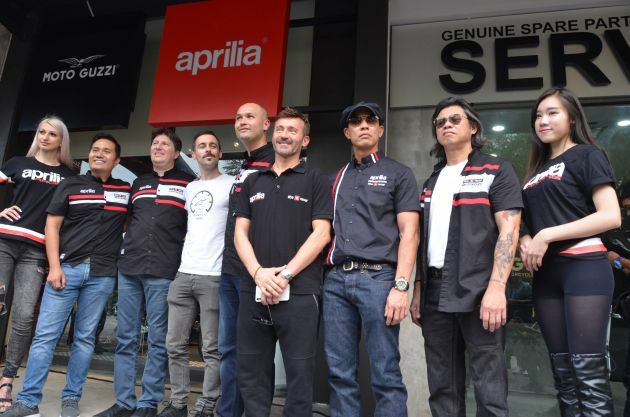 In conjunction with the recent Shell Malaysia Grand Prix held recently, Didi Resources, official distributor for Aprilia motorcycles in Malaysia, launched the Aprilia Malaysia showroom and 3S service centre. The event also saw the signing of a memorandum of understanding between Welly World Cycle, Sheng Fatt SUperbike and Soon Hin Co. and Didi Resources. The memorandum sees the three motorcycle dealerships being appointed dealer representatives for Aprilia in Malaysia. Welly World Cycle, located in Sungai Buloh, will cover the central region, while Sheng Fatt Superbike in Penang and Soon Hin Co in Kuantan will cover the northern region and East Coast of Peninsular Malaysia, respectively. Gracing the event was former Grand Prix motorcycle road racing World Champion and winner of the 2010 and 2012 World Superbike Champion Max Biaggi along with Aprilia MotoGP team riders Aleix Espargaro and Scott Redding. The Aprilia Malaysia showroom and service centre covers 2,104 square feet and is located at The Gasket Alley, Petaling Jaya. “Our vision is to create a new ownership experience for existing and new customers where owning a motorcycle goes beyond just the product. We will continue to invest in after sales improvement and value-added services to increase the ownership experience like dedicated track days, racing support, rides and gathering that is niche and unique to each Aprilia owner,” said Rewi Hamid Bugo, chairman of Didi Resources. Why made such acclaim ? What have you experience in the pass? New Malaysia is attracting more investments….everybody likes a clean and uncorrupted country!! Everybody likes a clean and uncorrupted country but unfortunately New Malaysia is going further from it. What a pity. Next Post: VW Polo B&W – habis terjual dalam 1 minit di Lazada!